The Feast of Saint Rabelais – Zero Equals Two! Unfortunately there are more legends than facts about François Rabelais The dates of his birth and death are only scholarly guesses. No record of his activities for long periods has survived. 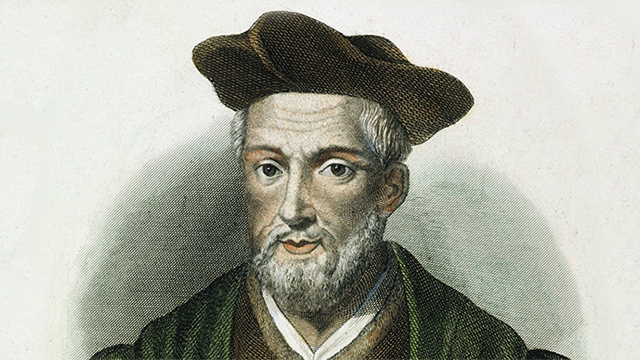 Most certainly born in the closing years of the 15th century, Rabelais consequently experienced a time of considerable ferment in the history of France’s institutions and intellectual life. Unless one grasps the issues and the attitudes in this crisis, much of Rabelais’s work is meaningless or subject to misinterpretation. One of the things that makes Rabelais an important and influential writer is that, in his writing we see the evolution of the humanist thinking that was to make writers like Cervantes and Shakespeare such powerful representatives of Renaissance literature, both to a large extent influenced by Rabelais. There are few writers in the history of literature who have had such an influence on later writers as had Rabelais. In Pantagruel, Rabelais sang the praises of the wines from his hometown of Chinon through vivid descriptions of the eat, drink and be merry lifestyle. In this spirit, here is a delightful dessert you can enjoy for the Feast of Rabelais, or any other day you like. To make the red wine jelly, put the red wine, jam sugar, star anise, clove, cinnamon stick, allspice, split vanilla pod and seeds in a medium saucepan. Stir together, then heat gently to dissolve the sugar. Turn up the heat and boil for 20 mins until reduced and syrupy. Strain into a small, sterilised jam jar and leave to cool completely. Will keep in the fridge for up to 1 month. Take the pastry out of the fridge and leave at room temperature for 10 mins, then unroll. Heat the grill to high and heat the oven to 180C/160C fan/gas 4. Cut out 2 x 13cm circles of pastry, using a plate as a guide, and place on a non-stick baking sheet. Sprinkle each circle with 1 tbsp sugar and grill for 5 mins to caramelise, watching carefully so that the sugar doesn’t burn. Remove from the grill. Can be done a few hours ahead, and left, covered, out of the fridge. Peel, quarter and core the apples, cut into 2mm-thin slices and arrange on top of the pastry. Sprinkle over the remaining sugar and pop in the oven for 20-25 mins until the pastry is cooked through and golden, and the apples are softened. Remove and allow to cool slightly. Warm 3 tbsp of the red wine jelly in a small pan over a low heat with 1 tsp water to make it a little more runny, then brush over the top of the tarts. Tip the crème fraîche into a bowl, sift over the icing sugar and cardamom, and mix together. Carefully lift the warm tarts onto serving plates and serve with the cardamom crème fraîche. Je m’en vais chercher un grand peut-être; tirez le rideau, la farce est jouée. (I am going to seek a grand perhaps; draw the curtain, the farce is played.) –Last words, according to the Life of Rabelais (1694) by Peter Anthony Motteux.